The 1929 baseball season was a big one for the Chicago Cubs and the Philadelphia A's. The Cubs fought their way to the 1929 National League Flag, and the A's won the 1929 World Series. Find highlights from the 1929 baseball season below. The Cubs breeze to the National League pennant by 101/2 games. The A's have an even easier time in the American League, romping home 18 games ahead of the Yankees. The A's win the 1929 World Series in five games. In game four, the A's score ten runs in the seventh and win 10-8. Mule Haas of the A's, with two big homers, is the Series' hitting star. Howard Ehmke fans a Series record 13 Cubs in game one. Cub Hack Wilson leads all hitters in the Series with a .471 batting average. Rogers Hornsby of the Cubs wins the National League MVP (the American League discontinues the award after the 1928 season). Lefty O'Doul of the Phils, the National League bat champ with a .398 mark, is the MVP runner-up. O'Doul's average is a National League record for outfielders. Chuck Klein of the Phils wins the National League homer crown (43) in his first full season. Babe Ruth tops the majors with 46 homers and a .697 SA. George Earnshaw of the A's leads the majors with 24 wins. Wilson's 159 RBI are the most in the majors. Lefty Grove's 2.81 ERA is the only one in the majors below 3.00. Grove's 170 Ks are the most in the majors. Yankees manager Miller Huggins dies near the end of the season. Joe McCarthy of the Cubs wins the first of what will be a record number of Major League Baseball pennants. Giant Mel Ott, age 20, becomes the youngest player ever to hit 40 homers in a season; he hits 42. Hornsby's .380 BA sets a Cubs team record -- the fourth such record he's set in the decade. Braves owner Emil Fuchs manages his own team for the full season -- the last owner to do so. The Braves finish with the worst record in the majors (56-98). Carl Hubbell of the Giants no-hits Pittsburgh on May 8. 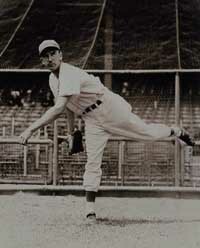 Carl Hubbell of the Giants. Ike Boone of the Mission Reds in the Pacific Coast League collects 553 total bases. O'Doul's 254 hits are a major league record for outfielders. Johnny Frederick of Brooklyn sets an all-time rookie record with 52 doubles. O'Doul reaches base an National League record 334 times. Find even more highlights from the 1929 baseball season in our final section.